A version of this article was published in the Newsletter of the William Morris Society, Summer 2010. 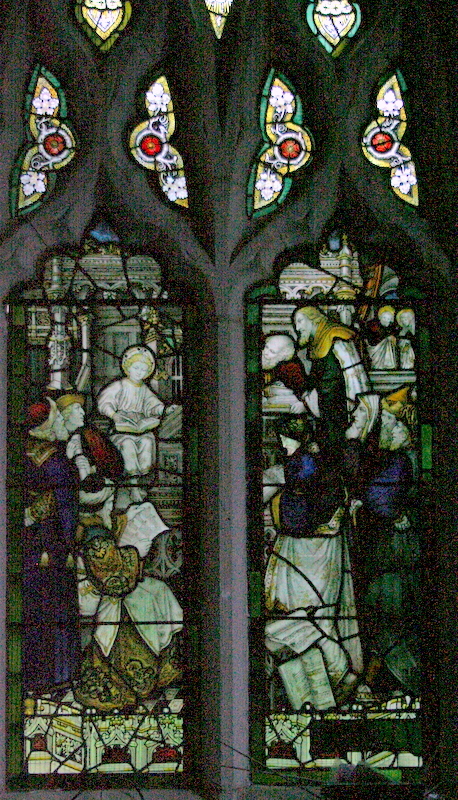 Compared with many other counties in England, Cornwall is somewhat disappointing territory for admirers of the stained glass of William Morris (originally Morris, Marshall, Faulkner & Co., and after 1874 Morris & Co.).1Ladock parish church has three Morris windows,2 and St Germans two.3 Single examples were inserted at St Michael Penkevil,4Stratton5 and Flushing:6 a grand total of only eight windows for the whole county. Figure 1. St Saviour, Polruan. 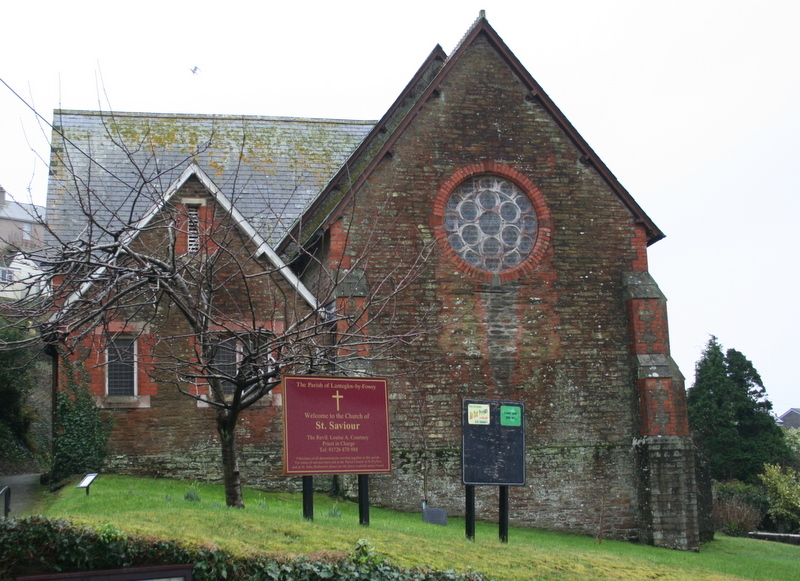 The parish church of St Saviour in Polruan was built as a Mission Church to Lanteglos-by-Fowey in 1891 for the cost of £1,500.7 This rather unprepossessing building (Figure 1) halfway up the steep hill opposite the port of Fowey contains seven stained glass windows which, on first impression, appear to date to the church’s consecration. This is deceptive, as the parish records of 1956 reveal that by the mid 1950s all the windows were still glazed with the original plain glass. By then, however, the exposed position of the church and the rigours of the Cornish weather had resulted in serious problems to both the glass and stonework.8 The debate about a possible restoration of the windows rumbled on until April 1958, when as a result of a chance remark in a letter, 9 the Diocese of Southwark offered the parish four windows and a medallion by the studio of Charles Eamer Kempe. Figure 2. Shepherds at the Nativity, by Kempe. Figure 3. Jesus as a boy with his parents Mary and Joseph, by Kempe. Figure 4. Christ and the doctors in the temple, by Kempe. Figure 5. The Annunciation, by Kempe. Figure 6. Salome with the young James and John, designed by Edward Burne-Jones and made by Morris & Co. Figure 7. 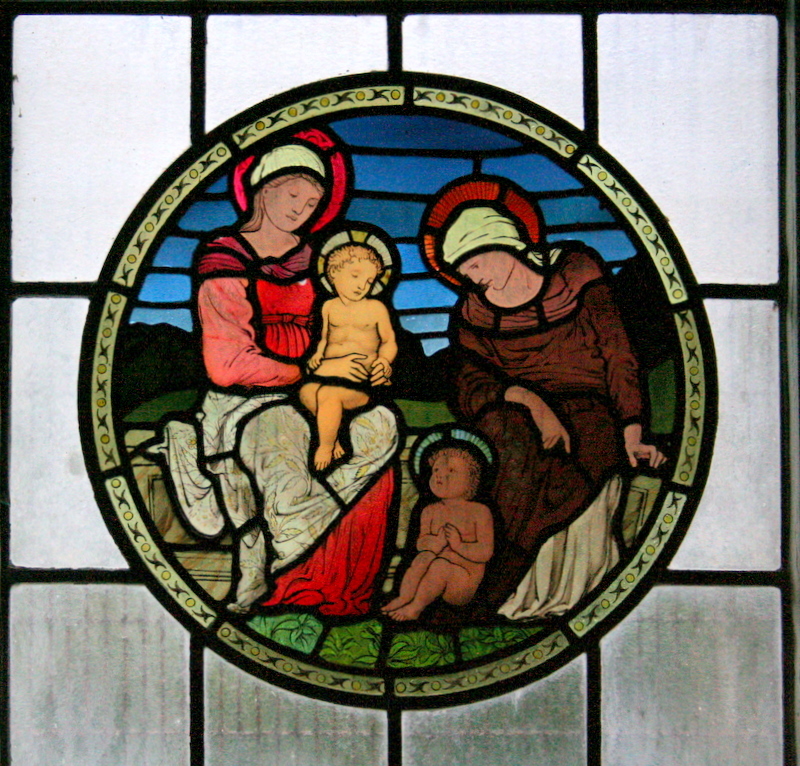 The Blessed Virgin Mary with Jesus and Elizabeth with John the Baptist, designed by Edward Burne-Jones and made by Morris & Co. Compared with the more traditional subjects of the accompanying Kempe windows, the subject matter of these two circular windows is highly unusual. Both contain mother and child representations (Figures 6–7). The first window was of a mother with two children, representing Salome with the young James and John. The second had two mothers, each with a small boy: this being the Blessed Virgin Mary with Jesus and Elizabeth with John the Baptist. There appears to be no public published attribution for these two small circular windows. 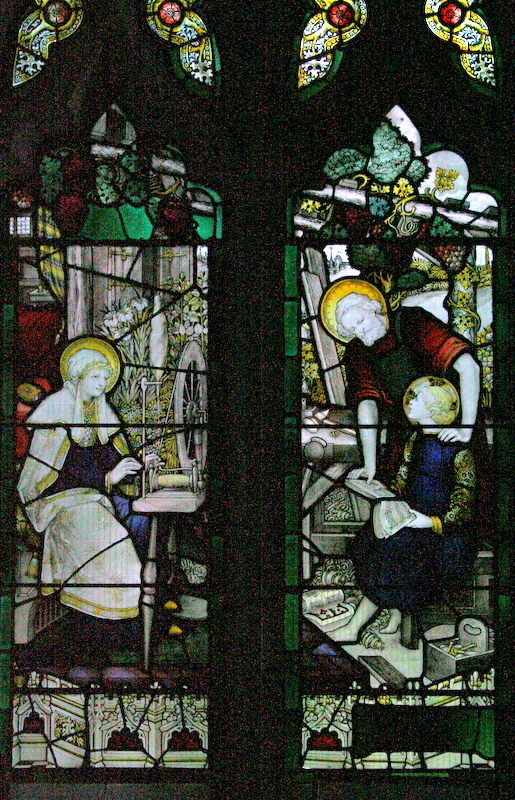 During a chance visit to Brampton in Cumbria, the same designs, the Holy Family and Salome with James and John, were recognised by the author in two windows of 1888 on the south wall of Brampton church.14 Here, the designs are square, not circular, but otherwise the cartoons are identical to the Polruan windows. Sewter identifies these two designs by Burne-Jones as originally being used at Paisley in 1876,15 secondly at Brampton, and for the third and last time at the St David School Chapel at Reigate in 1892. 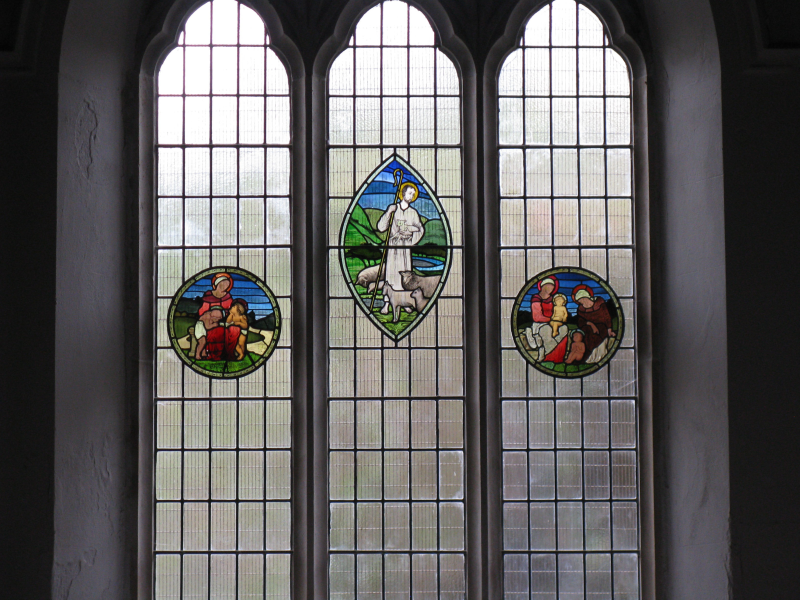 He also refers to the Kempe windows at Reigate being removed to Polruan, Cornwall, but offers no record of the fate of the Morris windows: this is a problem which at present eludes solution. It now appears that they were in fact included in the consignment of Kempe windows as extra glass in 1958. Figure 8. 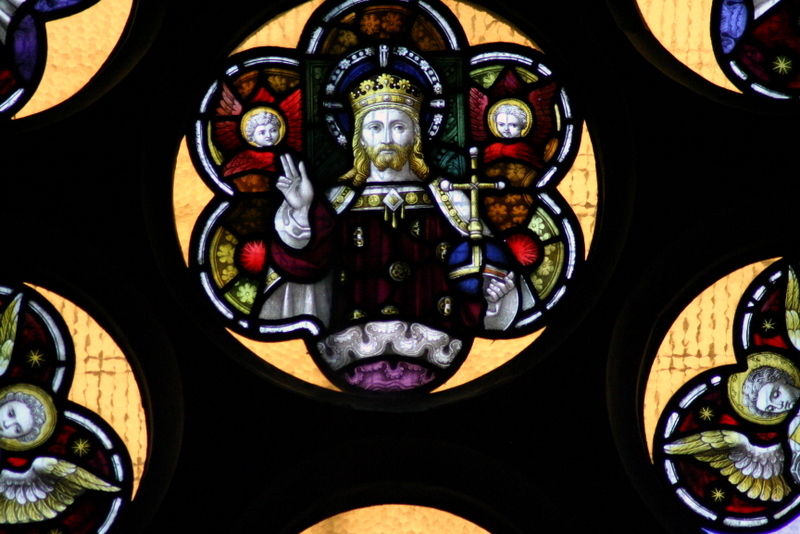 Christ the King surrounded by six angels playing musical instruments. Figure 9. Detail from the centre of Figure 8, showing Christ the King. Figure 10. 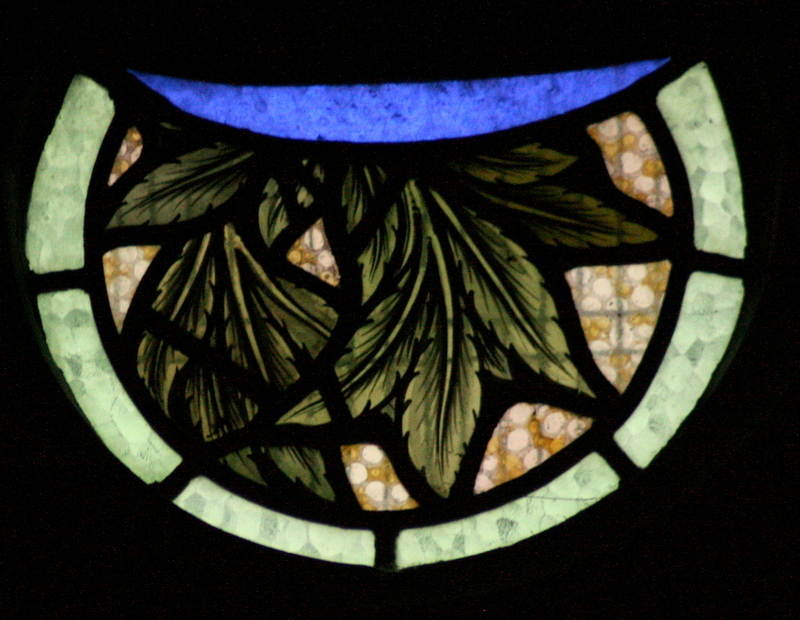 Detail from the periphery of Figure 8, showing one of the leaf motifs that might have been made by William Morris originally to surround the roundels in Figures 6 and 7. There is one further part of the story however. Also included in the boxes from Southwark was as already mentioned a medallion by Kempe. It was reported in February 1959 to the PCC that glass experts 16 were trying to piece the extra glass together and that there might be sufficient to form a rose window over the altar. This was subsequently completed and inserted in January 1961. It consisted of the figure of Christ the King surrounded by six angels playing musical instruments and a further outer ring of twelve crescent-shaped leaf motifs (Figures 8–9). The attribution of Christ and the angels to Kempe is dubious both on stylistic grounds and also because the Kempe records contain no reference to such a subject at the Reigate school chapel. These crescent-shaped leaf motifs in the outer ring however are distinctly Morris in style and colour (Figure 10). The crescents are evidently of a smaller diameter than the present rose window and look as if they were originally made to fit round smaller circular windows. Sewter refers to a drawing of the design for one of the original Reigate Morris windows as having five ‘lobes’. On this drawing the proposed subject of Drink to the Thirsty was crossed out and replaced with Subjects chosen, Holy Family, Salome with James and John, March 22, 1892 . This drawing obviously showed work in progress, and one wonders whether the ‘lobes’ were later increased to six for each circular window at Reigate, and that they too found their way into the boxes as extra glass, ultimately to end up as the outer ring of a composite rose window. Measurements establish that six crescents would actually fit round each of the circular Morris windows. Figure 11. 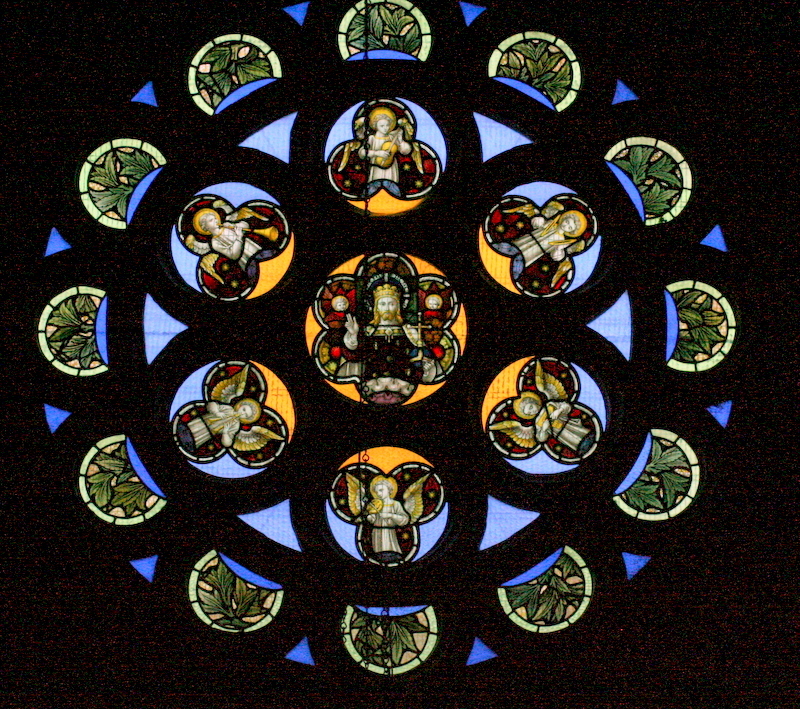 The south transept window showing the Good Shepherd, by Sue Ashworth, in the middle light, with the two Morris roundels shown in Figures 6 and 7, in the left and right-hand lights. Figure 12. The Good Shepherd, by Sue Ashworth, from the centre of the south transept window shown in Figure 11. A final postscript to the story remains. When the results of this research were originally published it was realized that the Morris roundels were quite vulnerable in their original position low down on the south wall. 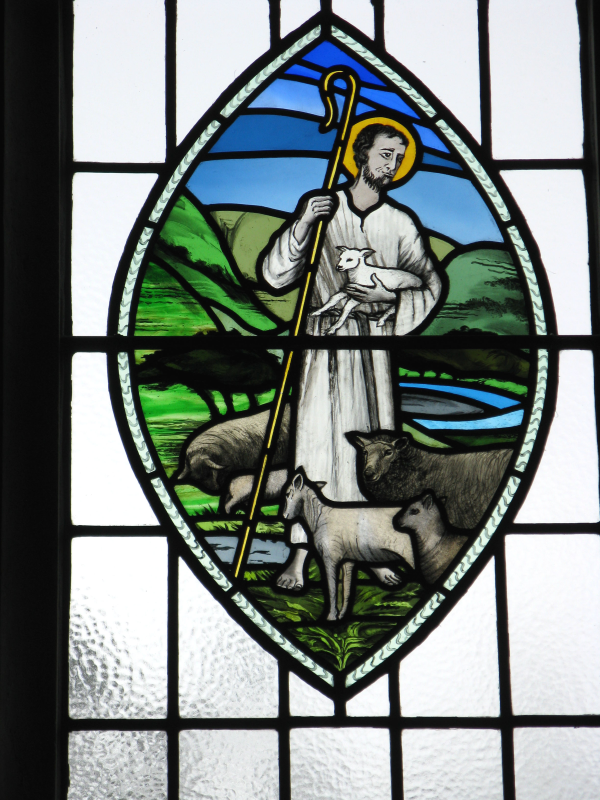 After discussion it was decided to move them to a higher and less vulnerable position in the three-light south transept window, and that a new design for the central light of a Good Shepherd window be commissioned from the designer Sue Ashworth FBSMGP, who lives in the parish. 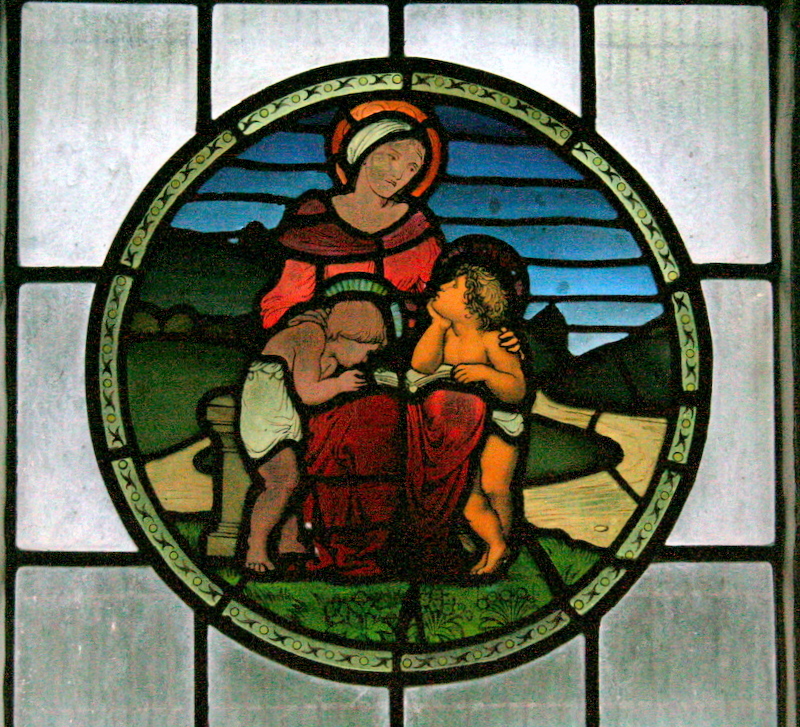 The new window with the Morris roundels was dedicated in 2012 (Figures 11–12), and the south wall windows were filled with some attractive modern roundels also designed by Sue Ashworth (Figures 13–14). Figure 13. 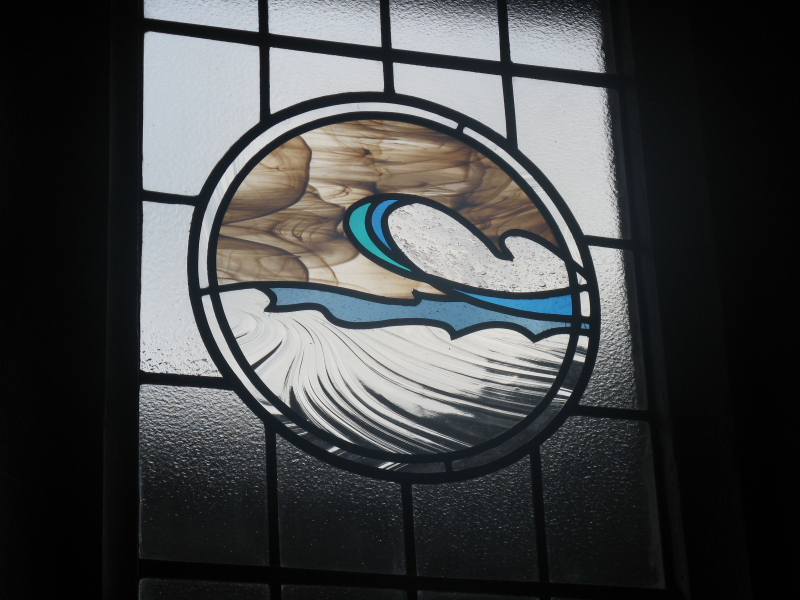 Roundel by Sue Ashworth in the south wall. Figure 14. 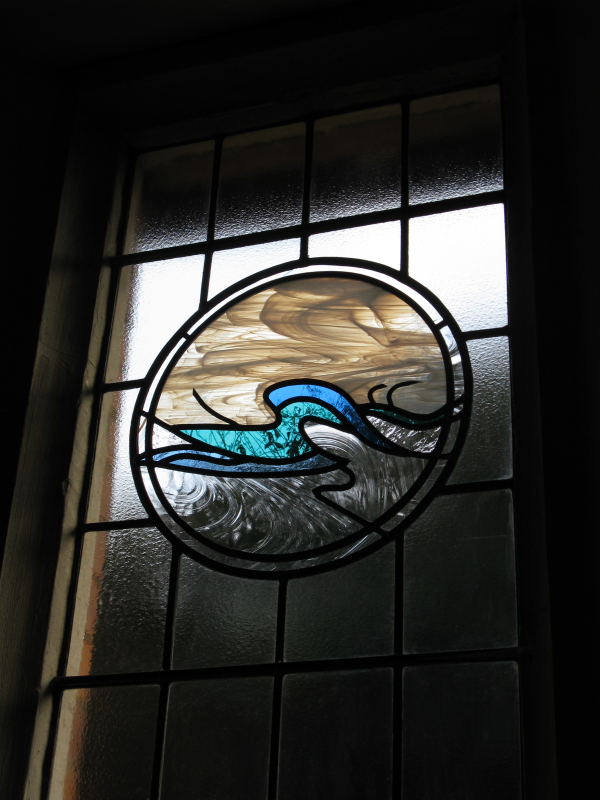 Roundel by Sue Ashworth in the south wall. So, after fifty years, these two windows can now be correctly attributed, so boosting the county’s total of Morris windows by 25%. It is somewhat amazing to think that of all the thousands of visitors to the port of Fowey over the past five decades no one seemed to realise that a few minutes’ boat journey and a steep walk away were two fine examples of the art of William Morris and Edward Burne-Jones just waiting to be discovered. AC Sewter The stained glass of William Morris and his circle—a catalogue (Yale 1975) pp 250–252. Ladock. Chancel east 1864; Lady Chapel east 1870, South aisle west 1897. St Germans. Chancel east 1896; South aisle 1902. St Michael Penkevil. Chancel east 1866. Truro Diocesan Kalendar 1892. Consecration 10th November 1891. Cornwall County Record Office (CCRO) P116/2/34, PCC minutes 1956. CCRO P116/2/34, Notes of the windows March 1960. Ed by PNH Collins The Corpus of Kempe Stained Glass in the United Kingdom and Ireland (Liverpool 2000), pp 289 and 46. CCRO P116/2/34, PCC minutes 3rd November 1958. CCRO P116/2/35, letter dated 22nd November 1958 from Mr SL Burdett, secretary to Polruan PCC, to the architects Higman and Ford of Launceston who were responsible for the whole restoration. Brampton. South aisle third from east and easternmost, 1888. The windows featured in the Autumn 2008 Newsletter of the William Morris Society. G. Widger & Sons, 57 Mutley Plain, Plymouth, Devon.